There are 4 classes of membership: Annual $7.50; Sustaining $12.50; Fellowship $20.00; and Life $150.00. All memberships start with January of the current year. President W. R. Paylen, Calif.
1st Vice Pres. Elmer J. Lorenz, Calif.
2nd Vice Pres. Eric Knobloch, La. 1970-1973: Lottie Cave, Wm. Dunbar, Elmer Lorenz, Edward McWilliams, Patrick Mitchell, Eric Knobloch, Kelsey Williams. 1971-1974: David H. Benzing, Fritz Kubisch, George Kalmbacher, Wilbur Wood, W. R. Paylen, Kathy Dorr, Amy Jean Gilmartin, Bea Hansen. 1972-1975: Jeanne Woodbury, Ralph Barton, George Anderson, Virginia Berezin, Victoria Padilla, Charles Wiley, Ervin Wurthmann, Jean Merkel. Adda Abendroth, Brazil; Luis Ariza Julia, Dominican Republic; David Barry, Jr., USA; Olwen Ferris, Australia; Mulford B. Foster, USA; Marcel Lecoufle, France; Harold Martin, New Zealand; Richard Oeser, Germany; Dr. W. Rauh, Germany; Raulino Reitz, Brazil; Walter Richter, Germany; L. B. Smith, USA; R. G. Wilson, Costa Rica; J. Marnier-Lapostolle, France. Are All Variegated Bromeliads Infected With a Virus? Articles and photographs are earnestly solicited. Length is no factor. Please mail copy and all questions to the editor, 647 South Saltair Ave., Los Angeles, California 90049. 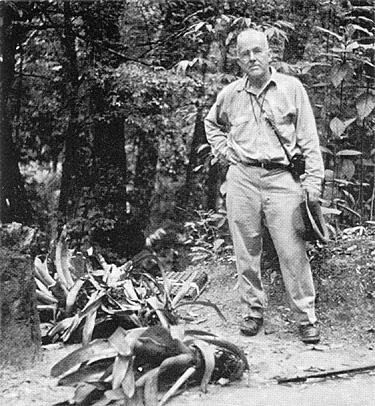 I have often wondered where we bromeliad growers would be today if we did not have Dr. Lyman B. Smith, taxonomist and senior botanist at the Smithsonian Institution in Washington, D. C., to act as our mentor and to guide us in the identification of our plants. Of all the men behind the scene, he is by far the most indispensable, for he is ever ready to help us in the many dilemmas that confront us in our collecting of bromeliads. It goes without saying that Lyman B. Smith is the foremost bromeliad authority in the world today, having devoted practically all of his life to the study of these plants. A native of Boston, he attended Harvard where he pursued the study of botany. In 1926 he started his graduate work, choosing the then little known (in the United States) plant family—the Bromeliaceae. Until that time he had been strictly a local floral botanist, but since then bromeliads have been his overwhelming interest and line of research. After two years of graduate study he received a Sheldon Traveling Fellowship to go to eastern Brazil. There he was able to see at first hand the plants which he had studied usually from dried materials only and to study at the Instituto de Botanica, Sao Paulo, under the directorship of Dr. Hoehne. After one more year of study at Harvard, he completed his dissertation—a monograph on one subgenus of Tillandsia and an account of the bromeliads of British Guiana. 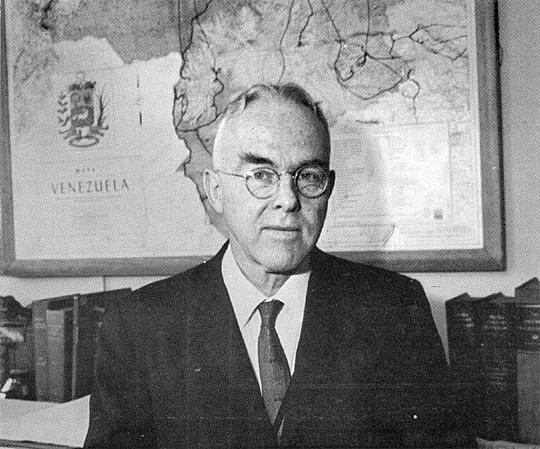 In 1931 Dr. Smith joined the staff of the Gray Herbarium of Harvard University at Cambridge, Massachusetts, where he had access to its great library and collection and was given the opportunity to go abroad a number of times and to do considerable work at the British Museum and Kew Gardens in England and at the botanical museums of Brussels, Leige, and Paris. He was able to examine many of the older herbarium collections and he photographed the original types of many of the first bromeliads brought into cultivation. In 1947 he left Harvard to go to the Smithsonian Institution, where he is now Curator of Phanerogams of the U. S. National Museum of that Institution. Unlike many botanists who are content to pursue their studies with desiccated herbarium specimens, Dr. Smith seizes every opportunity to visit South America and to examine bromeliads in their native habitat. As a result of his many studies in the field he has published a number of works pertaining to the flora of specific Latin American countries. However, Dr. Smith's writings do not end here. For many years he has identified thousands of bromeliad specimens that have been sent to the Gray Herbarium and the Smithsonian Institution. The number of new species which he has described is legion. These descriptions generally appear in the publication Phytologia, which is a gold mine of bromeliad information. In past issues he has rewritten the keys to Vriesea, Tillandsia, Pitcairnia, Puya, Bromelia, Dyckia, Guzmania, and Neoregelia. Dr. Smith reads and writes in five foreign languages: German, French, Spanish, Portuguese, and Latin, and not a few of his publications have been written in these languages. At present Dr. Smith is busy on a key to the entire bromeliad family, which will be the greatest treatise on the Bromeliaceae so far published. He has found that the great monograph of Carl Mez, published in 1935, no longer is accurate, so he has set out to rectify the many inaccuracies prevalent in the earlier work. Dr. Smith now recognizes 45 genera in the place of the 50 given by Mez, discarding Aregelia, Chevaliera, Disteganthus, Sodiroa, Lindmania among others and at the same time creating new genera, such as Fosterella. Dr. Smith's work will be in three separate volumes : Pitcairnioideae, Bromelioideae, and Tillandsioideae. At this writing only Pitcairnioideae is completed. We bromeliad growers cannot praise too highly the great work that Lyman B. Smith is doing. According to Mulford B. Foster, "His tireless industry and enthusiasm surpass all of the former authorities in this family; he has dedicated his life to the study of bromeliads, and a more devout and sincere student this family has never known." Kurt Peters has added another species to the small and little known genus Ronnbergia and also to the seemingly inexhaustible flora of Panama. Since many bromeliad lovers have not even heard of Ronnbergia, a little explanation is in order. Without careful examination of the flower, a Ronnbergia would be mistaken for an Aechmea with a simple subdense to lax inflorescence. The basic difference is that Ronnbergia lacks the petal appendages that Aechmea has, or the same difference as between Tillandsia and Vriesea. 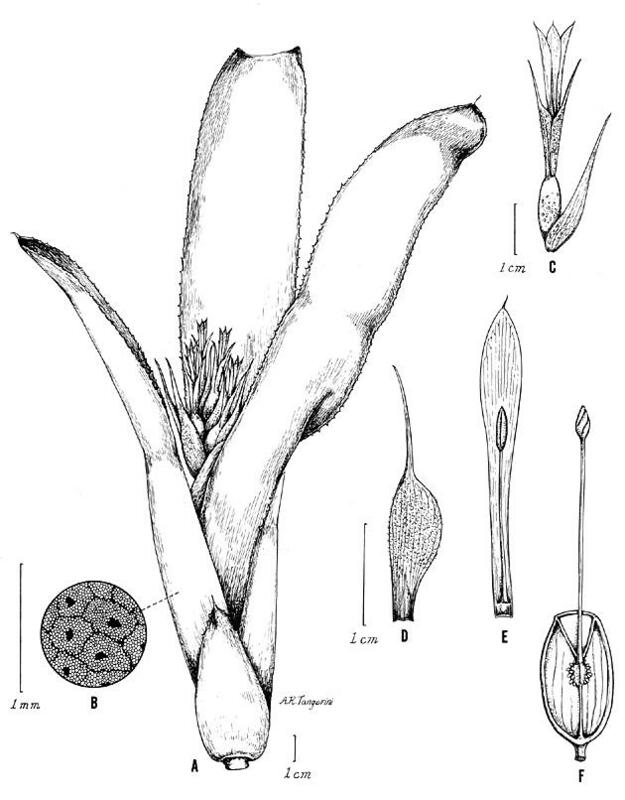 Another comparison that comes to mind is that while the first Aechmea was collected about 1787 and published in 1803, the first Ronnbergia was collected some 80 years later and published in 1874. Since then Aechmea has grown to a genus of over 160 species while the present addition only brings Ronnbergia to a count of 8. Linden and Andre started the genus with Ronnbergia morreniana, the most ornamental of all the species with its large petiolate dark spotted leaves. Eduard Morren in 1885 just before his death, described a second species, Ronnbergia maidifolia and Mez in his 1896 monograph published R. columbiana. In his 1935 monograph he still had only 3 species, but then the great wave in Latin American collections began to take effect. RONNBERGIA PETERSII L. B. Smith, sp. nov. A R. deleonii L. B. Smith, cui affinis, sepalis minoribus, foliorum laminis ligulatis basi haud angustatis medio haud canaliculatis differt. LEAVES few in a funnelform rosette, 30 cm long, much exceeding and nearly concealing the inflorescence, covered throughout with appressed white scales; sheaths suberect, elliptic, 12 cm long, finely purple spotted; blades divergent, ligulate, not narrowed at base nor medially channeled. SCAPE erect, short, slender, sparsely white-lepidote; scape-bracts imbricate, ovate, attenuate to a fine mucro, pale green, laxly serrulate, sparsely white-lepidote. INFLORESCENCE simple, subcapitate, 4 cm long, sparsely white-lepidote except the petals. FLORAL BRACTS like the scape-bracts, about equaling the lowest flowers, much reduced upward; flowers sessile or short pedicellate, suberect. SEPALS strongly asymmetric with a broad right wing, 23 mm long, connate for 2 mm, the narrowly triangular apex 10 mm long and merging into a long slender mucro; petals lavender, naked, 27 mm long; ovary subglobose, 10 mm long; epigynous tube crateriform, 3 mm high; placentae apical. 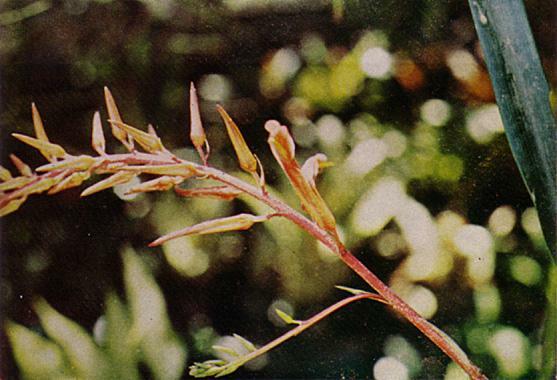 PANAMA: Cerro Jefe at about 2500 ft., Kurt Peters s n (US, type), cultivated and flowered, April 1972. 1. Sepals 23-30 mm long, less than 1/3 connate, the apex attenuate; inflorescence subcapitate. 2. Leaf-blades narrowed at base, with whitish median channel. Colombia. 1. R. deleonii. 2. Leaf-blades lingulate, not narrowed at base nor channeled. Panama. 2. R. petersii. 1. Septals 4-18 mm long, the apex broad, mucronulate or unarmed; inflorescence elongate, lax or sublax. 3. Leaf-blades more or less narrowed at base, petiolate or subpetiolate; sepals 4-10 mm long, about half-connate or more. 4. Blades not over 35 mm wide or 35 cm long, attenuate, slenderly petiolate. 5. Leaves entire. Costa Rica. 4. R. hathewayi. 5. Leaves serrulate. Colombia. 5. R. killipiana. 4. Blades 50-90 mm wide, 25-90 cm long. 7. Leaves spotted; blades broad-based. Colombia. 6. R. morreniana. 7. Leaves concolorous; blades narrowly cuneate at base. Panama, Colombia. 7. R. maidifolia. 6. Leaf-blades broadly subpetiolate, wholly serrulate to subentire. Panama, Peru. 8. R. explodens. —Smithsonian Institution, Washington, D. C.
I have recently had several cases of albino offsets occurring with variegated bromeliads and am writing to ask if this is at all unusual and if there might be anything causing it. Several years ago I purchased some plants of Aechmea fasciata var. variegata and A. fasciata var. albo-marginata from M. Marcel Lecoufle, France. Two have flowered and produced normal offsets, but an albo-marginata has developed an albino offset. This is an overall creamy-white with no green whatsoever, but very faint stripes and crossbands visible and a pinkish tinge to the underside of some leaves. The pup has grown rapidly despite the absence of any foliar feeding. My problem now is how to keep the pup alive. If it is detached from the parent, it will presumably die. As the parent has already flowered, will it succumb when the old plant dies or will it continue to live on the roots of the mother plant? Like all my bromeliads, it is growing in a mixture of old tree fern fiber, orchid mix, and peat. I remember one of the A. fasciata variegatas also did not develop normally. In this case the plant had rather narrow green central stripes on the leaves, which were more creamy than white. As it grew the green area got less and less until some new leaves had no green at all. At this stage the leaves with little or no green started to die back from the tips and edges, but the plant produced one offset also with narrow green central stripes. When this pup was about five inches high, I detached it and potted it separately, but after a while the leaves withered back from the ends and it died. The old plant, now rather dilapidated, had one more offset with very small green stripes, but quite nicely shaped with narrow flaring leaves. When this pup had reached three inches it, as well as the parent, expired. At the moment I am also having trouble with a variegated Ananas bracteatus which came from Puerto Rico. One of several nice plants, it had leaves with 2 or 3 narrow green central stripes, outer edges creamy and, unlike the others, no pinkish tinge. New growth continued, but young leaves almost lost their green stripes, and now the newest ones are completely cream. Several weeks ago die-back started on leaf tips and some leaf margins, so I brought the plant into the lounge for more constant temperature. A friend advised watering it with a weak solution of glucose and water; this I have done and the rotting areas have dried up and no new ones formed. So I have hopes that now I can keep this plant alive. If all variegated plants were infected with virus, it would not take long for a whole collection to become infected either by plant contact, insect damage, or by cutting tools. We have grown variegated plants alongside solid green plants and never have been aware of the solids becoming variegated. We have observed variegated plants that have mutated to almost a solid green in an occasional growth. Virus disease usually cripples and weakens a plant, but this does not seem to happen in the variegated bromeliads that we grow. In the second place, if it were true, the virus would not obey any straight line but enter every part of the leaf and plant except the seeds. Meristematic tissue, offshoots, etc, would be viral. Under such conditions there would be no definite pattern but a mottled mosaic of patterns. I speak from considerable experience in virus diseases in other plants. The variegations arise in a single cell that loses all or part of its ability to produce chlorophyll. On a single variegated plant an offshoot might be all green or all white (the two extremes) or it might be anywhere in between. In some plants the white may or not be flushed with pink or red, or it may even be purple from the anthocyanin (purplish coloring in the leaves). The original mutation (variegation) may be from an injury, a chemical, weather etc., but most likely is from lack of proper nutrition at some difficult period in food and water intake. Such mutations are often seen in soils with no proper balance between iron and manganese; lime and magnesium; acidity too high or alkalinity too high; aluminum too high, deficiency of zinc or molybdenum, or several other factors of concentration of plant acids in cells that draw out those in other cells. When the ability to produce chlorophyll has been lost, the tissue can only reproduce itself and live off the green tissue as a parasite might do. When there is too much white tissue the plant can die. Sun or shade benefit only the green portion, and if the sun is too strong there will be burnt or necrotic areas in the white. The problems I speak of occurred often in sugar cane, and I was in the industry as an agronomist, for some 45 years. I was born into it. We did have bacterial and fungal diseases that did make variegations, but these were necrotic. But other real variegations occurred often in sugar canes, and also they mutated to other colored stripes on stalks and leaves. These variegations, like those in all plants, went on into every part of the plant and especially the inflorescence. They often stunted a plant because there was not enough food to go around. All variegations are mutations and mutations are not viral. There are even mutations in quantities of vegetable growth that can give 20 to 25% more yield or produce big robust growers. These often result in doubling or high multiplication of the chromosomes in the plant, and gigas forms with thicker parts result. The opposite is the losing of a few chromosomes, with the inability to carry out proper breeding, and this often results in the production of beautiful variegated plants which can only be reproduced asexually. One might comment that areas exist where mutations are common. Red flowered plants produce stunted straw colored flowers. This happens with zinnias on soils high in manganese or iron which upset the balance necessary between these for proper growth. Variegated phalaenopsis orchids have been obtained which failed to breed and no amount of fertilizer corrected the problem. There are many viral laboratories throughout the country; by using rabbit blood tests they can prove whether virus exists in any plant, whether variegated or not. It is strange that so many variegated plants come out of the lowlands of Europe that have high marl, chalk, and red sandstone soils that are alkaline. Bromeliads are acid lovers or they would not be epiphytic (living on trees) or live in acid compost from leaves. Variegated plants are deficient plants, minus ability to grow normally and man has foolishly, but beautifully protected these weaklings, often for the single purpose that no one else has them and not for their healthy vigor and beauty. Much of the popularity of these plants is a created popularity by the owners. As they become more extensively grown and trouble arises in maintaining them, the fad will fade. I have seen many waves of fashion in plants and in the end the strong vigorous plants take over and man tires quickly of maintaining weaklings. Colored bars, colored stripes, waxy sheen, etc. are often mutations, but under all of them is green chlorophyll that lets the plant function properly and breed. Pitcairnia hybrids are scarce in the bromeliad world—few growers taking much interest in this large and often interesting and beautiful genus; so when a pitcairnia hybrid makes it debut, it is news indeed. Sr. Luis Ariza-Julia of Puerto Plata of the Dominican Republic has long been interested in this genus, having collected the pitcairnias native to his land and making copious studies of them. The cross pictured here is his first registered hybrid of this genus. Plants stemless, few leaved. Sheaths castaneous, outer leaves to 1 meter long, 15 mm wide in the center, the lower part of all leaves narrowing petiole like, deeply channeled, entire. The center leaves are shorter and wider to 30 mm, resembling the chiapensis parent. The flower scape is shorter than the outer leaves, bent by the weight of the flowers, 4 mm in diameter, red, sparsely white floccose, scape bracts narrow lanceolate, green. Sepals and petals are orange, tips obtuse, twisted together to cover stamens and stigma as usual in the genus. Photographs are of the first plant to flower, but the color of the flowers has been remarkably consistent in the later flowering plants. The relation between Puya and hummingbirds implied in the preceding issue can be confirmed by publications dating from as early as over a hundred years ago; however, this information can easily be overlooked because it is found in zoological rather than botanical journals. The earliest reference appears to be by Thomas Bridges, a collector who sent birds from Bolivia, Chile and northwestern Argentina to England around the middle of the Nineteenth Century. Notes accompanying a shipment of his specimens were published by Fraser (1843) : these indicate that "Pourretia coarctata" (=Puya chilensis) is a major food source for the Giant Hummingbird near Valparaiso, Chile, where breeding birds of this species reside in the Austral spring and summer. 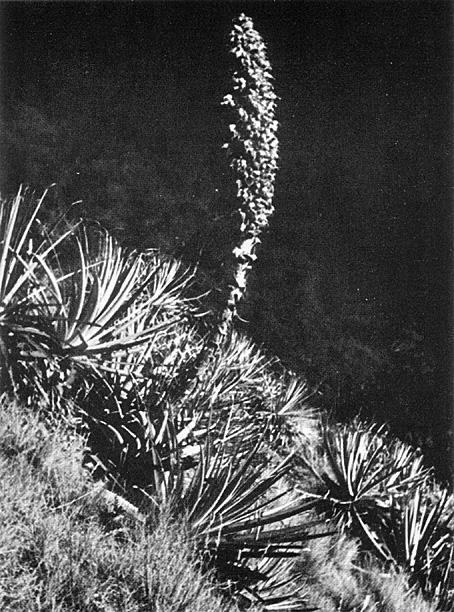 These observations are independently validated by Landbeck (1876), who states that the Giant Hummingbird not only prefers "Pourretia coarctata" and "Pourretia gigantea" (Puya chilensis and probably Puya berteroniana), but that the bird ranges in central Chile over the same altitudes as these plants. Additionally, Giant Hummingbirds have been recorded visiting 2 m-tall "Pourretia" (Puya) inflorescences in the Peruvian highlands (Dorst, 1956). To these more or less casual records we must add the observations of Federico Johow (1910), a botanist who taught at the Universidad de Chile in Santiago around the turn of the century and who wrote an excellent flora of the Juan Fernandez Islands (1896). Although his writings are a monument to Chilean science they have remained relatively obscure because they appeared in Chilean and German journals. One of the few English references to his work is by Robinson (1950), but this author cites only a portion of Johow's finding on Puya. It seems worthwhile therefore to review the highlights of Johow's work. He had noticed that Chilean Puya present a peculiar pollination syndrome because of their showy tubular corolla, lack of floral scent, abundant nectar, sticky pollen and simple stigma. Taken together these features seem to point to birds and rule out insects or wind as pollinators. In fact, by denying birds access to Puya flowers one could easily prove that seed production is upset; furthermore Johow noted that except for the introduced Honeybees no other insects were particularly fond of Puya flowers at least as pollinators. He kept a list of the visitors he saw in the plants and noticed that the most consistent one is the Giant Hummingbird, recorded at P. chilensis, P. "caerulea" (P. berteroniana) and P. venusta. Another common visitor is the Austral Blackbird, Curaeus curaeus, which perches on the projecting spikelets of the inflorescences of P. chilensis and P. "caeurulea" and has no trouble introducing its face and relatively short bill into the shallow corolla tubes of these plants to drink nectar. After this happens a bird might show a bright smear of Puya pollen on its face; these blackbirds are omnivorous and regularly feed on Puya nectar when the plants bloom in the Austral spring, so that whole flocks seem to consist of pollen-dusted individuals at places where the plants bloom in concentrations. Interestingly enough, spikelets are missing and flowers are comparatively narrow and deep in P. venusta, which appears to be visited by giant hummers but no other pollination agents; the accessible cup-like flowers of the other two species provide nectar for hummingbirds, blackbirds and even for some finches and flycatchers which, like the blackbirds, gain access to the nectar from a perching position. Johow concluded from this that adaptation to particular pollinators is shown not only by floral characters but also by the shape of the inflorescence in these plants, the broadly ornithophilous forms providing shallow blossoms and perches for short-billed birds unable to hover. Besides birds an insect may pollinate Chilean Puya, namely, Castnia eudesmia, a large and colorful diurnal moth which is known to pass its larval and pupal stages on P. chilensis and P. alpestris; the adult form feeds on the plants' nectar much like a hummingbird, and like one gets dusted with pollen and thus it is presumed to effect pollination. Furthermore, individuals occasionally drive other insects and birds from their food plants. This information was reported by Gourlay (1950), who based it on an account in Spanish by Reed (1934), and who affirms that the association between Puya and this remarkable insect was known as early as in 1884. In that year M. North, on assignment for the Royal Botanical Garden at Kew, completed a painting entitled "Blue Puya with Moths" in the vicinity of Santiago. This account and an attempt to establish the proper names for Chilean species are in a second paper by Gourlay (1952). His nomenclature has been used in the foregoing as no other taxonomic treatment seems satisfactory. It is unfortunate that experiments on whether seeds are set by self-pollination have not been widely performed in Puya species; however, according to Johow (1910) and Gourlay (1950) at least two Chilean species are known to require outcrossing for production of viable seeds. Self-sterility is likely to be more widespread in the genus, and thus it is somewhat surprising to find many Puya species living vegetatively for several years before flowering. It would seem that these species, like the "Century Plant," save their reproductive effort for one big occasion; this might involve some risk because when that occasion comes the pollinator might be unavailable, with the result that many years of preparation and much energy would be wasted from the plant's point of view. Perhaps because of this most Puya have adapted to rely on bird rather than insect pollinators, the latter being relatively less mobile and abundant than birds at high elevations. Dependence on birds could even be of selective value on the trend for increased body size with elevation mentioned previously; the higher a Puya lives the more isolated it becomes relative to alternate nectar sources a bird might use, and thus the plant must cater to a relatively hungrier pollinator by providing greater amounts of nectar; these can presumably be supplied by a large plant better than by a small one. This explanation is probably a gross oversimplification; attraction of scarce pollinators is just one of the ecological problems that must be faced and solved by Puya plants. However, one can hardly escape thinking along these lines when one considers that these organisms are among the selected few able to survive in high mountains, and, furthermore, among the handful of plants able to reproduce there through the agency of animal pollinators. If animals are required for successful seed set in the lofty giant, Puya raimondii, then the pollinator-attracting mechanism the plant must use has to be very precise. This species is known to include long-lived individuals that go for scores of years without giving rise to either flowers or vegetative shoots; the reproductive effort of these plants comes just once at the end of their lives. Then a massive inflorescence is produced by each including enough flowers to potentially bear as many as 6.5 million seeds; if production of the latter depends on an animal's visiting the inflorescence and bringing pollen from another plant, then survival of Puya raimondii as a species rests on a delicate basis, having so far been achieved by virtue of refined adaptations. Just what pollinators and which adaptations are used by other Puya has been our subject in this discussion, which should emphasize the need for field research in the Andes to understand better the fascinating ecology of these bromeliads. Even as a zoologist I recognize that they offer exceptional material to explore questions of plant evolution and community structure, and I hope that some answers will be forthcoming through support and interest by people who enjoy bromeliads. Dorst, J. 1956. Etude biologique de Trochilides des hauts plateaux peruviens l'Oiseau, 26, 165-193. Fraser, L. 1843. On the collection of birds brought to England by Mr. Bridges. Proc. Zool. Soc. London, 108-121. Gilmartin, A. J. 1972. The Bromeliaceae of Ecuador. Phanerog. Monog., 4, 1-255. Gourlay, W. B. 1950. Puya alpestris in its native land. Royal Hort. Soc. Jour., 75, 399-402. Gourlay, W. B. 1952. Puya berteroniana. Kew Bull., 501-506. Johow, F. 1896. Estudios sobre la flora de las islas de Juan Fernandez. Santiago de Chile, Imprenta Cervantes. 287 pp. Johow, F. 1910. Estudios de biologia vejetal. I. Sobre algunos casos de ornitofillia en la flora chilena. Anales Univ. Chile, 126, 27-50. Landbeck, C. L. 1876. Der gemeine chilenische Colibri (Trochilus sephanoides Less.) als Traubenverwuster. Der Zool. Gart., Frankfurt, 17, 225-229. Ortiz-Crespo, F. I. 1969. Interactions in California Hummingbirds. U. C. Berkeley Thesis. Reed, E. P. 1934. La Castnia eudesmia Gray. Rev. Chit. Hist. Nat., 38, 267-271. Robinson, G. W. 1950. Some Chilean plants cultivated in Britain. Part 4. Royal Hort. Soc. Jour., 75, 278-288. Several members of the Queensland Bromeliad Society have had quite good results with their bromels by growing them on red sandstone rocks taken from a local beach at low tide. Needless to say, these rocks are covered by the sea at all high tide periods, are irregularly shaped, have small oyster shells adhering to their surface, and have copious apertures for arranging bromels. Mostly these "broms on rocks" are grown in the shadehouse as are the other bromeliads, so just as an experiment I decided to try them out under harder growing conditions. After obtaining suitable rocks, I scoured them with full pressure from a garden hose and allowed them to dry. My next step was to select species of bromels that had proven compatible to such a medium. My final choice was aechmeas, billbergias, and small neoregelias. Most of the selected rocks already had convenient cavities, but where necessary I gouged a small hole through the rock. I used hardly any potting medium, except where a loose plant had to be wedged firmly into place with a lump of staghorn peat. Now came the important decision of where to put the rock so that it would get good morning sunlight. For those who know my garden "jungle" this is quite a task. A large tree-sized philodendron was laboriously shifted to a new position, and in its space my wife erected a cement and rock mound some four feet in height having a ledge spiraling around it to the top. The newly "potted" bromel rocks were placed on the ledges of this mound, giving quite an unusual effect. This happened in June, 1971, and the ensuing winter caused a slight amount of leaf tissue burn on most of the plants mainly because the slanting winter sun played havoc with dew on bromel leaves. By the end of August, which is our spring, the leaves of all these had taken on a better coloring, and new offsets were visible. Spring in this climate is not wafted in gently as in some states; it arrives with a fanfare of trumpets, closely followed by summer heat. However, now that the bromels on rocks were established and firm, the extra light brought many pleasant changes in the leaf hues of individual plants and better coloration than I have achieved in growing under shade cloth or under the filtered light of a good tree. December came all too quickly, and by now it was apparent that each plant quite obviously enjoyed this method of growth. Now in early May many have grown full sized offshoots, achieved a good definite color, and show no signs of adverse effects I had expected from the sea salt in the rocks. Plants used were Aechmea fasciata, A. lueddemanniana, A. recurvata var. benrathii, A. orlandiana, Dyckia sulphurea, Billbergia × 'Henry Teuscher' × euphemiae, B. × 'Santa Barbara,' B. × 'windii,' Neoregelia tristis, N. carolinae, N. sarmentosa, N. ampullacea var. tigrina. If you have a third or fourth generation Vriesea splendens or Guzmania sanguinea, the chances are it is growing on top of an unsightly three-or four-inch woody stem. 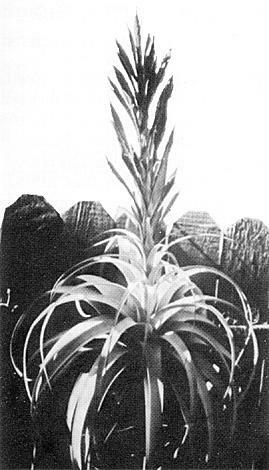 These bromels generally put up only one offset growing out from the center of the cup astride the inflorescence. As the new pup grows, the outer leaves of the parent die off. After a time all that is left of the parent is its stem which now supports the offset. By the third or fourth generation, it is advisable, culturally and esthetically, to create a new root ball for the offset. This can be done by air layering once the plant has reached mid-maturity. With a sharp knife shave off the outer woody layers of the uppermost one to two inches of the stem until you have revealed some of the root follicles. Dust this area with a rooting hormone, then wrap and tie a piece of wet sphagnum sheet moss around the shaved portion. Then cover the moss with several turns of plastic wrap. Please note that at this time you still keep the plant growing in its original medium. Once a week, remove the plastic wrap, wet down the moss, and then recover with the plastic. In about two to three months you should have a new root growth through and out of the moss. Now you can cut off the old stem below the new roots, remove the plastic, and replant in a new medium. —Reprinted from Bromeliana of the New York Bromeliad Society. Through the cooperation of the Research and Development Section of the Agricultural Chemicals Division of Amchem Products, Inc., several members of the New York Bromeliad Society recently con-ducted a series of experiments in inducing the flowering of bromeliads with Amchem's chemicals, Ethephon, Ethrel and Florel. This is a subject of particular interest to the New York Bromeliad Society because most of our members are apartment dwellers and, therefore, most of the light set-ups are inadequate. Any chemical that can safely bring bromeliads into flower is very desirable. Starting early in the summer of 1972, from June to August, seven (7) members of the New York Bromeliad Society treated a total of 207 plants. The summary of the results is presented in Table I. Of the 207 plants treated, 41 - about 20% - infloresced. Because of the date on which the report (Oct. 21, 1972) is written, there are still 23 plants that have started to infloresce. As indicated in the footnote to Table I, there are definite indications for this classification and it is probable that a fair percentage of those in this category will ultimately flower. Thus, the successful percentage may ultimately be around 30%. There were 85 plants that had no results whatsoever - a rather high figure of 41%. Since most of the plants treated were mature, it is possible that the surprisingly high percentage having no results may be due to lack of strength of the particular chemical in some of the treatments. The number that died totals 26, or 13%. While this is not a particularly disastrous percentage and can be explained in part by the strong solution used in one case, and the use of a pump sprayer in another case, the number that is characterized by severe deterioration totals 19. If this number is added to the 26 that died, to make a total of 45 experiencing unfavorable results, it can be seen that this almost equals the number with good results. Of course, virtually all those that experienced severe deterioration are putting forth offsets, so that the clone will be preserved. While we do not have statistics, our impression is that the Amchem chemicals resulted in a significantly greater number of offsets than other chemicals that have been used to induce flowering. 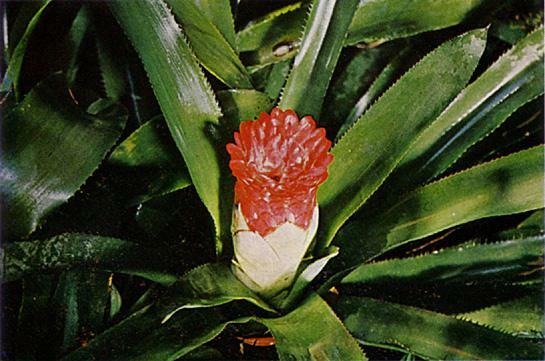 The members of the New York Bromeliad Society that engaged in this experiment have from time to time used BOH as well as other methods of inducing flowering in Bromeliads. In most cases, these other methods have yielded at least comparable positive results with much fewer negative results. Still, there are a number of positive features in the use of Amchem chemicals that warrant continued experimentation to discover the optimum strength and conditions of treatment. It was noted, for example, that many of the 41 plants that did flower, flowered very rapidly — some as little as three or four weeks after treatment. It was also noted that in several cases, several relatively small plants were brought to flower. For apartment house dwellers who must necessarily grow their plants under severe space restrictions, the ability to flower a bromeliad when it is less than full grown is a boon not to be underestimated. However, this result has to be counter balanced by the fact that in five cases the inflorescence was aborted; i.e., it did not rise to its normal height above the cup. This may or may not have been due to the relative immaturity of the plants in questions. While an analysis of Table I would show that Ethephon achieved the best results and Florel the worst results, an analysis of the treatments by each individual with each chemical will lead to a number of qualifications. Table II presents an analysis of Ethephon treatments by six (6) of the seven (7) individuals involved. For example, all four of the casualties in the use of Ethephon resulted from extremely strong solutions of 4000 and much higher PPM. Even the four cases of severe deterioration were the result of rather strong concentrations and all were the result of treatment in the cups. Two of the cases of severe deterioration were treated with 2000 PPM, one with 3000 PPM and one with 4000 PPM. A solution of 1,000 PPM achieved relatively good results with no bad results. This was true especially when a hand sprayer was used, but also when treatment was made in the cups. The types of plants that did infloresce covered a fairly wide range and included several Aechmeas, several Billbergias, several Guzmanias, two Nidulariums, one Quesnelia and several Tillandsias and Vrieseas. The results, especially with Billbergias, and Tillandsias (which for the most part lack cups and are, therefore, difficult to bring to flowering through chemical methods), are particularly impressive. It is worth noting that Individual C, who flowered five out of eight plants treated with Ethephon — a very high percentage — treated and grew all his plants outdoors. He had by far the best results of all the individuals that participated. As a matter of fact, Individual E who had relatively good results with Florel, also treated his plants outdoors. These experiences pose a question of whether natural light does not actually aid flowering, perhaps through additional ultra-violet or some chemical reaction that takes place in the process of photosynthesis. Altogether, a total of 19 plants flowered through the use of Ethephon, with an additional eleven (11) that may be starting. If just one half of the "maybes" infloresce, that would mean approximately one-third of the 75 plants treated would have positive results—a higher percentage than with any of the other Amchem chemicals. Moreover, negative results were much fewer and all readily explained. One interesting sidelight. 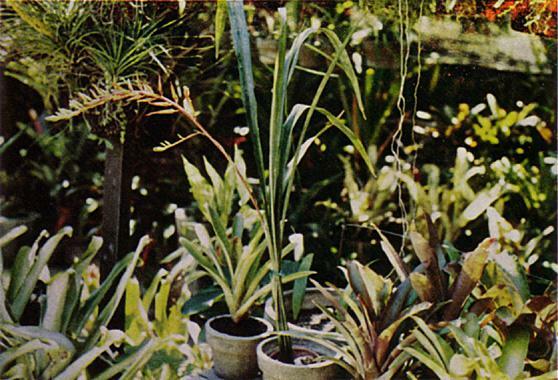 The author treated one batch of his plants in a very confined area (an indoor greenhouse — see March/April 1969 issue of Bromeliad Society's Bulletin, Page 42) and some weeks later noticed that a very small plant of Guzmania had started to infloresce. This plant was no more than 4 or 5 inches in height and it was pretty much like a seven-year old child giving birth. While the inflorescence is not fully open (and probably will not mature), the plant is in every way healthy and I would have to assume that accidentally in the spraying, some of the chemical hit the leaves of this plant and thus induced the inflorescence in an extremely immature plant. Table III stresses an analysis of plants treated with Ethrel. While flowering plants were fewer with Ethrel than with Ethephon or Florel, the figures are much greater in the "no result" category, percentagewise, than with the other chemicals. "Maybe Started" means that there are signs of "pregnancy" as, for example, a definite swelling of the leaves toward the base of the plant, the microscopic beginnings of growth at the base of the cup which may herald the start of inflorescence or, in the case of tillandsias and neoregelias, a pronounced reddening of the leaves that usually precedes or accompanies inflorescence. This is at least partly attributable to the fact that Individual B was the first to use Ethrel. He treated his four plants, all of which died, with 25 milliliters of Ethrel as is in the cups. It was obviously too much solution. The four plants that died were relatively sturdy Aechmeas, such as fasciata and Guzmania musaica. This intelligence, which was discovered very early in the Chapter's project, was communicated immediately to the other participants. As a result, the others reduced the quantity used. When treated in the cups, from 8-20 milliliters were used and relatively good results were achieved. The best results seemed to have been achieved with the use of 10-14 milliliters in the cups. In addition, Individual C and Individual G achieved some flowering when using Ethrel as is as a spray. If Ethrel is to be used as is in the cups, it must, of course, be compared with BOH which is general applied in diluted form in the cups. A ready made chemical that does not have to be diluted is certainly an advantage and obviously if Ethrel is used in the proper strength it will achieve at least as good results as BOH. Table IV presents an analysis of the treatments with Florel. While on the face of it, the adverse results would seem to far out-weigh the favorable results, this is distorted by the experience of Individual A. Here 20 plants were treated with (7) deaths and eight (8) cases of severe deterioration. However, this was the only case in which a power or pump sprayer was used and even though the solution was only 10,000 PPM, the use of the strong sprayer may very well have saturated the leaves with far more of the chemical than is proper for achieving good results. It should also be noted that Individual B used 8000 and 10,000 PPM in the cups and 13,000 PPM as a spray. These accounted for his five (5) deaths and three (3) cases of severe deterioration. When these are subtracted from the totals, then positive results would appear to outweigh the adverse results. This is supported by the experience of Individual D who flowered five (5) out of 20 plants by using 2500 PPM and applying the Florel in the cups, and also by Individual E who flowered five (5) out of ten (10) plants with Florel basically spraying with 1,000 PPM. Individual A commented in connection with the use of the pump sprayer that Florel had been used a few years ago on a clump of Tillandsia lindenii with excellent results, producing six inflorescences. By now the same clump had had at least 12 stalks that were mature enough to flower, but two-thirds of them died as a result of the too powerful application. The dilutions and resulting strengths may not be as precise as scientific experimentation would require, and further experiment is clearly needed to determine the proper strength to be used with Florel. The chemists will be able, perhaps, to explain what appeared to be two distinct chemical reactions, some of which accompanied the cases of severe burn. In a number of plants, there was apparently a form of crystallization, almost like a deposit of white salt. These appeared especially in one case where Individual B sprayed and at the same time emptied the water out of the cups. Noted either separately or in conjunction with the crystallization was the appearance in several cases of a scummy substance, rather opaque, at the top of the water in the cups. In certain cases, no adverse effect resulted; in fact, some inflorescences penetrated through this scummy film and flowered normally. In other cases, however, the inflorescence was aborted, perhaps as a result of contact with this scummy film. 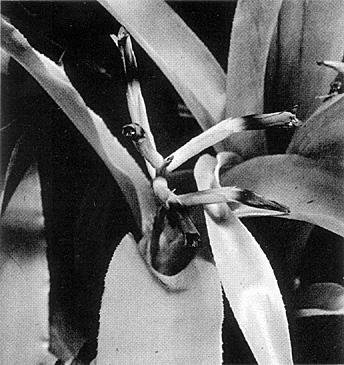 In conclusion, the Bromeliad Society's experiments with the use of Amchem chemicals certainly offer the potential of greatly increasing the flowering of bromeliads, especially those raised by apartment dwellers, but they do indicate that proper strengths and proper techniques are very important. It is likely that these chemicals are more stable than other chemicals that have been used to induce flowering and this would be another advantage, because apartment dwellers are generally in a position where they desire to treat just a few plants at a time. Moreover, the ability to flower bromeliads through a simple spray technique rather than the time consuming method of removing water completely from the cups, is most important. It would seem that Ethephon in a 1,000 PPM solution as a spray and Ethrel as is in the cups using a maximum of 15 milliliters per plant yield the best results. Quesnelias are endemic to eastern Brazil, where for the most part they grow close to the seashore. Many grow as terrestrials in the sandy littoral or in swampy forests; a few—especially those at higher elevations—are to be found growing on trees as epiphytes. Quesnelias are easy to grow. They are rugged individuals, thriving easily in southern gardens. Probably Q. arvensis is the showiest of the genus as well as one of the largest. Its firm leathery gray-green leaves, measuring up to 2 feet in length and 2 inches in width, are edged with sharp spines. It is a reticent bloomer, requiring the moist air from the ocean to flower, but once the plant is established, it forms a large clump and blooms every year. As its name implies, Q. humilis is the dwarf of the genus. It is a gay little plant, no more than 10 inches in height, making a nice pot specimen. Q. liboniana at first sight might be mistaken for a billbergia. It has stiffly tubular, light green leaves. Its gracefully arching flower stem bears a small but brilliant inflorescence with orange bracts and dark purple tubular flowers. Prize-winning Austin Bromeliad Society display. It incorporated 2 projectors which gave a continuous showing of bromeliads on the paper screens, one of which is on the right corner of the exhibit. 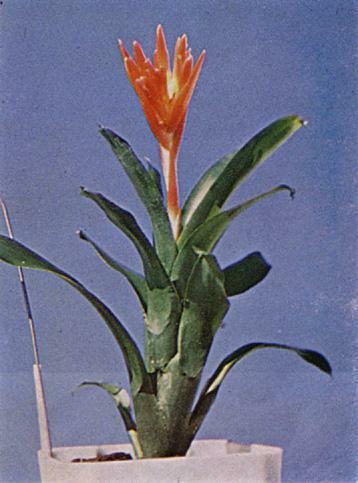 The Corpus Christi Bromeliad Society was host to the first regional show of the Southwest Bromeliad Guild of Texas held in Corpus Christi on November 10 to 12, 1972. Four Societies—Austin-Fort Worth, Dallas, Houston, and Corpus Christi—participated. The Austin Bromeliad Society won the silver award for the best society display. 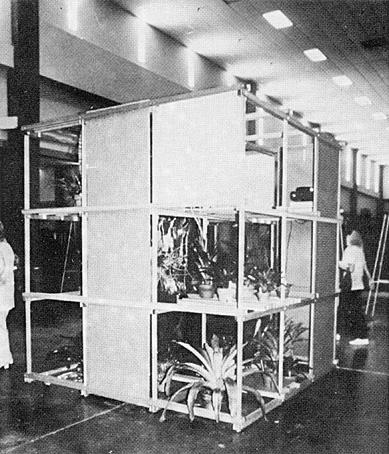 Three commercial firms exhibited: Ervin J. Wurthmann of Tampa, Florida; Dane Co. Bromeliads of Corpus Christi; and Aerial Gardens of Houston, Texas. The gold award for the most outstanding commercial exhibit went to Aerial Gardens. A collection of pen and ink drawings by Sue Gardner and an educational exhibit of Bromeliaceae by Dr. Edward McWilliams won honorable mention. Individual trophy winners included the following: E. D. Petterson for best foliage plant, Mrs. Charles Meilleur for best plant in bloom, Aerial Gardens for the most artistic terrarium planter, Charles Meilleur for the best artistic mobile, Mrs. Charles Meilleur for the best grown plant in bloom. Sweepstakes went to Aerial Gardens. On Saturday morning, November 11 a symposium was conducted by Mr. Ervin Wurthmann on judging bromeliads. He discussed standardizing judging methods, developing a training program, and enumerated the points a student should observe when judging a plant. The first speaker for the afternoon conference was again Mr. Wurthmann, who displayed several new bromeliad hybrids and rare species. In addition to discussing his plants, Mr. Wurthmann described the art of hybridizing and the cultural requirements of different types of bromeliads. Dr. Edward McWilliams, a plant specialist from Texas A & M College, gave a slide program showing bromeliads in their natural habit in Brazil. He emphasized the identification and growth patterns of Bromeliaceae. 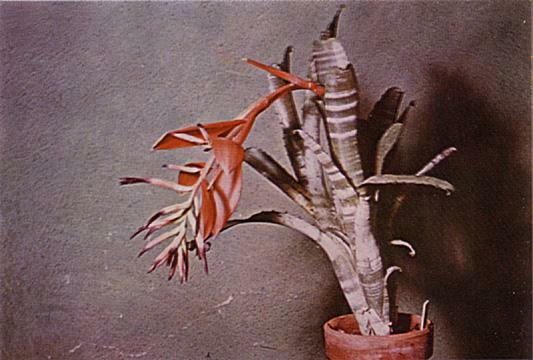 At the banquet held in the headquarters motel, Holiday Inn, that Saturday evening, Mrs. David Gardner gave a slide program showing bromeliads in their natural setting in Mexico. Mr. Gene Blacklock followed with a discussion on the preservation of species and especially Tillandsia baileyii which grows in south Texas. Corpus Christi Bromeliad Society members—Mr. and Mrs. Ira Phelps, Mr. and Mrs. Charles Meilleur, Mr. and Mrs. David Gardner, and Mr. and Mrs. Claud Ward were hosts to the garden tour on Sunday morning. We, the members of the Corpus Christi Bromeliad Society, are grateful to the faithful and dedicated people who worked diligently to make this first regional guild show a huge success. THE ORGANIZATION OF THE BROMELIAD SOCIETY, INC. The concept of affiliation is almost as old as the Society itself, the first group so designated being the Bromeliad Society of Southern California with its headquarters in Los Angeles. Later, in 1954, the Louisiana Bromeliad Society, under the leadership of Eric Knobloch and Morris Henry Hobbs, became the second group to be chartered. Since that time the "family" has grown considerably, so that at this writing there are 23 member organizations scattered throughout Australia, England, New Zealand, and the United States. What does affiliation mean? Its fundamental purpose is to disseminate knowledge and evoke interest in bromeliads through the formation of local groups. True, such groups need not be affiliated to attain this end, but the two-way- exchange between the Bromeliad Society and the affiliated organizations has proven to be mutually beneficial, for each has contacts, resources, and opportunities which the other may lack. The affiliated society, for example, can bring to the attention of bromeliad growers in the local areas the facts of the Bromeliad Society's existence, the desirability of membership in the Bromeliad Society and receipt of its Journal and other individual services—all of which tend to make bromeliad growing more interesting, exciting, and rewarding. In turn, the Bromeliad Society—through its international prestige and publicity—comes in contact with thousands of people who are newly interested in bromeliads, many of whom can be directed to local groups. 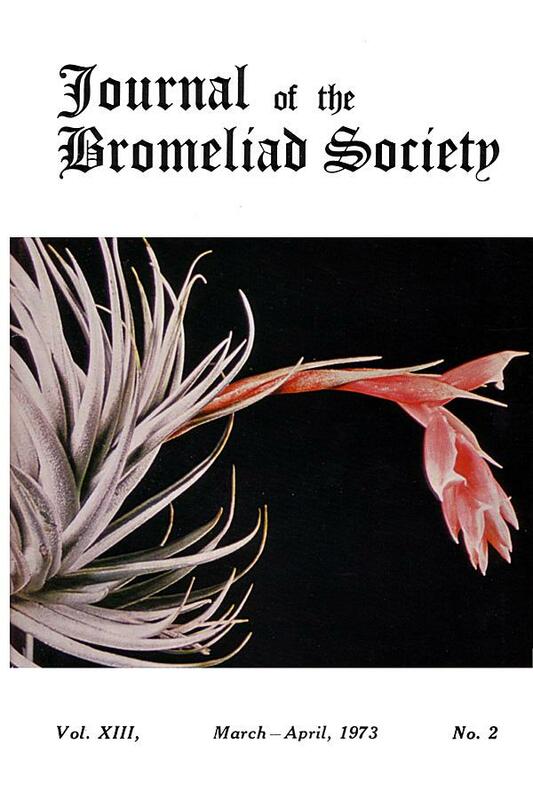 The affiliated society has the privilege of reporting its meetings, its shows, and its specialized activities for possible publication in the Journal of the Bromeliad Society. The affiliated society has access to the library of slide programs which the Bromeliad Society is continually expanding in both scope and quality. The affiliated society may use the words "Affiliated with the Bromeliad Society, Inc." on its letterheads, publications, and publicity. The affiliated society may request the Bromeliad Society for "Best in Show" trophy for its local exhibition, provided that the show meets certain specific standards. The affiliated society may reprint articles from the Journal of the Bromeliad Society in its own publication provided due credit is given. The affiliated society may contact the Bromeliad Society for advice, guidance, reference material, and similar assistance in connection with problems of society management, new activities, and special projects. The affiliated society may participate in all phases of the program for affiliated societies, which is being constantly developed by a committee set up for that purpose to assist local groups. How does a local group become affiliated? All that is needed is a letter from that group signed by three members of the Bromeliad Society, Inc., asking for affiliation. The request will then be considered at the next meeting of the Board of Directors, and if granted, the new affiliate will receive a charter of affiliation. There must be at all times three members in the affiliated society who are members of the Bromeliad Society, so that lines of communication can be kept open. The affiliated group shall keep the Bromeliad Society informed as to changes in officers. Otherwise, the affiliated society is pretty much on its own. It may be a closed group with a limited membership or it may be an ever-expanding organization with affiliates of its own. It may pursue such activities as it may desire, provided that the best interests of the Bromeliad Society, its many members, and growers of bromeliads throughout the world are kept in mind. The following is a list of affiliated organizations. Members who would like further information as to meeting place and date should write to Mr. Patrick Mitchell, 4324 Bettis, #6, Houston, Texas 77022. Although for many of us billbergias were the first bromeliads we knew and grew, as we enlarged our collections we tended to discard these early loves for something we considered to be a bit more sophisticated. Anybody could grow billbergias; we wanted something more of a challenge. And then, too, the inflorescence lasted for such a short time. No one can deny that billbergias are among the loveliest of all bromeliads, with an elegance of form and brilliance of inflorescence unequalled in the plant family. When grown singly in a container so that their full beauty can be appreciated, they are outstanding plants indeed. Billbergia vittata, with its handsome striped or dotted foliage, is such a bromeliad. Its tubular rosette may attain three feet in height. Its firm gray-green foliage, often turning to purplish brown, makes a stunning foil for the showy, arching inflorescence with its brilliant red bracts. The flowers have violet and green petals and reddish with violet sepals. The prominent stamens are a bright orange-yellow. The peduncle may measure up to two feet; the panicle, one foot.